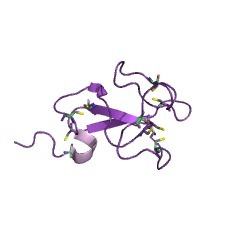 This entry represents a chitin binding domain [(PUBMED:10770921)]. It is found in (amongst others) the Peritrophin-A chitin binding proteins, particularly the peritrophic matrix proteins of insects and animal chitinases [(PUBMED:9651363), (PUBMED:8621536), (PUBMED:9256413)]. Copies of the domain are also found in some baculoviruses. It is an extracellular domain that contains six conserved cysteines that probably form three disulphide bridges. 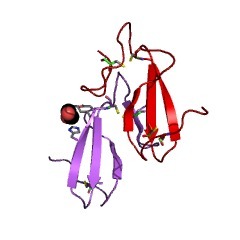 Chitin binding has been demonstrated for a protein containing only two of these domains [(PUBMED:9651363)]. There are 46118 ChtBD2 domains in 18434 proteins in SMART's nrdb database. Taxonomic distribution of proteins containing ChtBD2 domain. This tree includes only several representative species. The complete taxonomic breakdown of all proteins with ChtBD2 domain is also avaliable. Click on the protein counts, or double click on taxonomic names to display all proteins containing ChtBD2 domain in the selected taxonomic class. 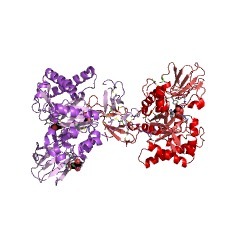 Structural and functional definition of the human chitinase chitin-binding domain. Mammalian chitinase, a chitinolytic enzyme expressed by macrophages, has been detected in atherosclerotic plaques and is elevated in blood and tissues of guinea pigs infected with Aspergillus. Its normal physiological function is unknown. 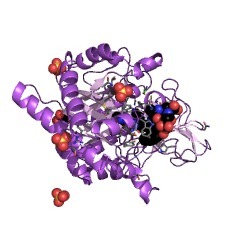 To understand how the enzyme interacts with its substrate, we have characterized the chitin-binding domain. 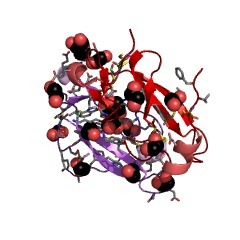 The C-terminal 49 amino acids make up the minimal sequence required for chitin binding activity. 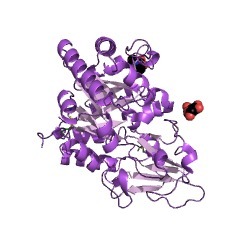 The absence of this domain does not affect the ability of the enzyme to hydrolyze the soluble substrate, triacetylchitotriose, but abolishes hydrolysis of insoluble chitin. 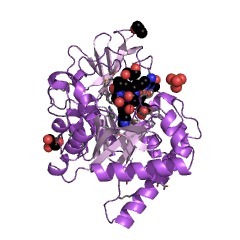 Within the minimal chitin-binding domain are six cysteines; mutation of any one of these to serine results in complete loss of chitin binding activity. Analysis of purified recombinant chitin-binding domain revealed the presence of three disulfide linkages. The recombinant domain binds specifically to chitin but does not bind chitosan, cellulose, xylan, beta-1, 3-glucan, beta-1,3-1,4-glucan, or mannan. Fluorescently tagged chitin-binding domain was used to demonstrate chitin-specific binding to Saccharomyces cerevisiae, Candida albicans, Mucor rouxii, and Neurospora crassa. These experiments define structural features of the minimal domain of human chitinase required for both specifically binding to and hydrolyzing insoluble chitin and demonstrate relevant binding within the context of the fungal cell wall. This information is based on mapping of SMART genomic protein database to KEGG orthologous groups. Percentage points are related to the number of proteins with ChtBD2 domain which could be assigned to a KEGG orthologous group, and not all proteins containing ChtBD2 domain. Please note that proteins can be included in multiple pathways, ie. the numbers above will not always add up to 100%.